Backdoor.Teamviewer is a Trojan infection which feign to be an Adobe Flash Player installer, but actually, it’s a malicious computer programs that hacks into your PC and bring destructive alteration on your computer. This Trojan deceives the computer user to get in to user’s computer. First it installs a copy of the TeamViewer remote access application on to the target computer and when the TeamViewer is installed, it reconnects to the hackers Command & Control server and adduce the IP address of the infected PC. Once the hackers get the IP address of the victim’s computer, they can access the victim’s computer remotely and take remote control of it. Once they are connected, they can use the user’s computer as if they are in front of the computer. This remote access give the attackers access to not only your computer but your data also. Now they can view your confidential documents, steal personal photos, and run any program that can steal your passwords and other useful information. Unfortunately, users can’t noticed the presence of this Trojan because it doesn’t give any clue to the users to indicate its presence. The only single clue is if you notice the %AppData%\Sin\5s.exe application running on your PC. Every computer user need to run a good antivirus application with updated security definitions to detect such malware. If your security application detects any of the following Trojan.Teamspy, Win32.Trojan-spy.Teamspy, Backdoor.TeamViewer,Gen:Variant.Mikey, and Trojan-Spy.Win32.Teamspy, then you have got Backdoor.Teamviewer malware. The Backdoor.Teamviewer Trojan makes a sneaky entry and itself as an Adobe Flash installer. It misleads the users by sending them a messagethat your Adobe Flash is outdated or there is a need to install a new version of Adobe Flash to access the content on the page whenever you try to access it. If you click on the download button of the installer, it installs the genuine Flash on to your PC, but also install the Backdoor.Trojan alongside without letting you know. This installation completes in the background. If you come to know that your computer is infected with the Backdoor.TeamViewer application, remove it instantly before it do any harm to your computer. Below the instructions are written to get rid of Backdoor.Teamviewer malware and any other related program. There are two methods to clean your computer from the grip of these malware agents. One is automatic removal from the help of a software tool and another method is manual removal. New computer users are advised to use automatic removal method and experts may choose any of the two. Try this method only if you’re an advanced computer user and also make sure that you take the backup of your data before initiating the removal process. If you face any problem in between, don’t hesitate to ask the experts for help. These steps can be used to remove this infection for free. Please print the instructions asyou may need to exit from your browser window or reboot your machine. Sometimes Backdoor.Teamviewer has a usable Uninstall entry that you may use to remove the program. To perform this function, click on the Start button then openthe Control Panel. Windows XP users need to double-click on the Add or Remove Programs icon. Users ofWindows Vista, Windows 7, Windows 8, and Windows 10 need to double-click on the Uninstall Program option. As soon as the Add or Remove Programs or the Uninstall Program screen come up, scroll through the complete list of programs and double-click on each of the foreign entries listed to uninstall them. After double-clicking on each of the suspicious entries, follow the default prompts to remove all files and all configuration information related to these programs. In between, if you’re asked to reboot your computer, do not allow it to reboot until you have uninstalled all of the programs listed above. Close the Control Panel screens once you’re done. defencebyte antivirus pro is a virus, malware, and other types of infection removal tool. It automatically detects the threats and remove them from your machine. To make your computer infection free you need to install and download defencebyte antivirus pro. After downloading the software, just follow the steps given below to install, scan, find and remove any malicious Trojanfrom your system. Close all the running programs including this one, after the download is complete. Then double-click on the icon on your desktop defencebyteAVPro.exe. This step will begin the installation in your system. Once the installation starts, you must keep following the prompts to keep up with the installation process. Make sure you don’t make any changes to default settings. After the program has finally installed onto your system, the user must leave defencebyte AntiVirus Pro checked. Lastly press the Finish and if in case, defencebytes prompts you to reboot the system, then it is advised not to do so. 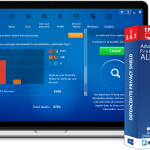 defencebyte AntiVirus Pro is ready to scan your system. Now click on Scan button to start up with the scan. In case of any update regarding defencebyte is available, the download and installation will automatically take place before the scan performs. defencebyte AntiVirus Pro will now begin with the scanning your system for any kind of malwares present in your system. This step could take a while so you are requested to work on something else and keep checking up on the status from time to time. After defencebyte AntiVirus Pro is finished with scanning, the malware which has been found will show up on your screen. The user should now press on Clean Now to delete all the malware and foreign agents that showed up. The defencebyte AntiVirus Pro will now start deleting all the files and registry keys. In this step, defencebyte might require a reboot to be able to delete some of them. Please allow the reboot to take place if it appears on the screen. If it displays a message stating that it needs to reboot, please allow it to do so. Please continue with the steps after the system has been rebooted and the user is logged in. 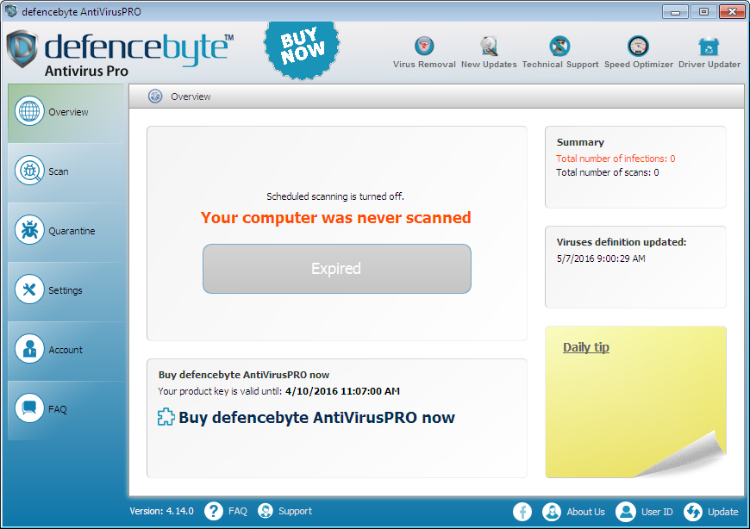 You can now close defencebyte AntiVirus Pro.